As Tanzania waits to witness the swearing of its new President, Dr. John Pombe Joseph Magufuli, a group of 33 people are in remand after being charged with among others destroying the ballot boxes by setting them on fire. 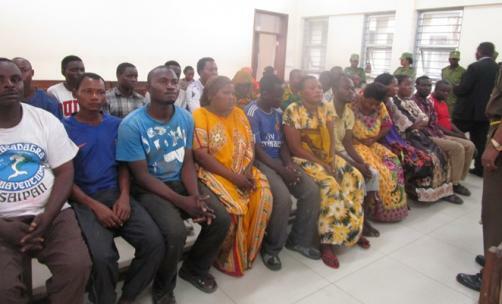 Before the Kisutu’s Senior Resident Magistrate Emillius Mchauru, Senior State Attorney Joseph Maugo told the court that the defendants committed the offences on October 27, this year at Mbagala Majimatitu within the Temeke District. It was claimed in court that the accused maliciously destroyed by setting on fire 11 ballot boxes with ballot papers valued TZS 2.2 million, property of the National Electoral Commission (NEC). Maugo said before destruction of the ballot boxes accused persons had created an unlawfully assembly in a manner that caused the neighborhood reasonable fear. The accused were further said to have threatened the NEC election officer to declare the parliamentary results for Mbagala Constituency without following NEC rules and regulations. Mbagala constituency is one of the constituencies in Dar es Salaam in which parliamentary election results were delayed due to various reasons. The situation led impatient members of some of the parties involved to attempt to pressure for the announcement of the results. Said Magungu (CCM) emerged the winner for Mbagala Constituency parliamentary seat. All accused were sent back to remand after failing to meet bail requirements and are due in court on November 12.